Many "thank yous" to the team for turning up at the Boston Local Food Festival and the Belle Isle Marsh Festival this past weekend. 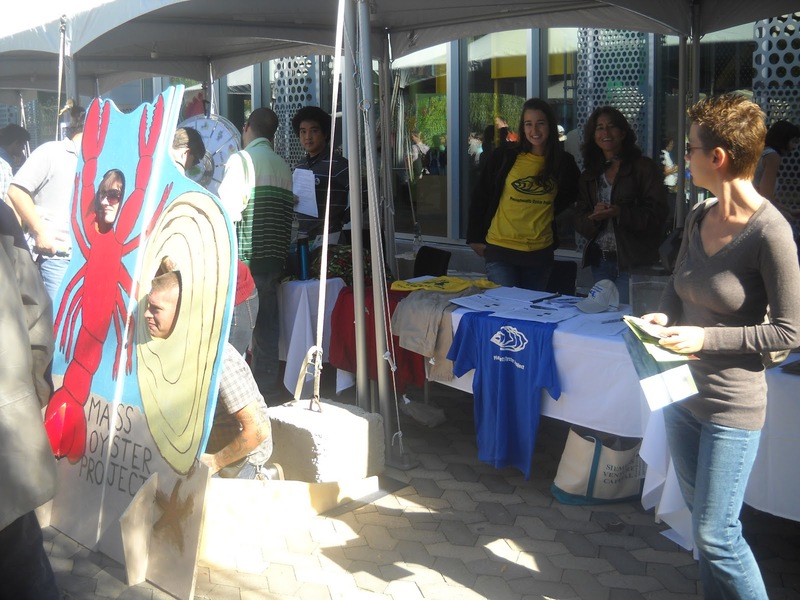 We met with hundreds of people;tgetting out our message about oysters naturally cleaning the water and adding to biodiversity. Hannah Dale was fearless as our crab-wrangler in the touch tank. It was a male green crab. Anamarija Frankic of the Green Boston Harbor Project also provided support. The active crowd on the banks of Fort Point Channel stood in stark contrast to the blank slate of the water surface. 160 people signed our petition to begin a pilot oyster restoration project in Fort Point Channel. On Friday we removed our oysters from the Dorchester Yacht Club per the request of the Division of Marine Fisheries. Remarkably the average length grew 10% in September and the weight even more so. We will be using data from the placement at Scientific Presentations this fall. Over 90% of that population is now at a size which they are capable of reproduction. The Ibutton containing the temperature data is being sent for download by our scientific team.